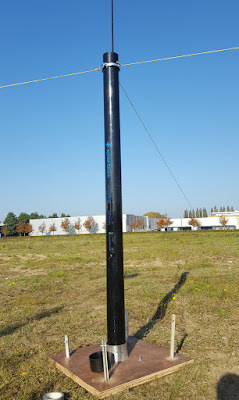 In January of this year I received the Spiderbeam 26m HD fiberglas pole. It is the tallest they have and afaik the tallest you can get. Cool for low band antennas with little compromise. I used it only a few times as I can normally get all the antennas I have on my 18m pole (or on my aluminum mast) and I simply did not have the time to build and test low band antennas. When I did bring the mast out I was reminded of its size and weight - 2m when collapsed and an interesting 18kg. 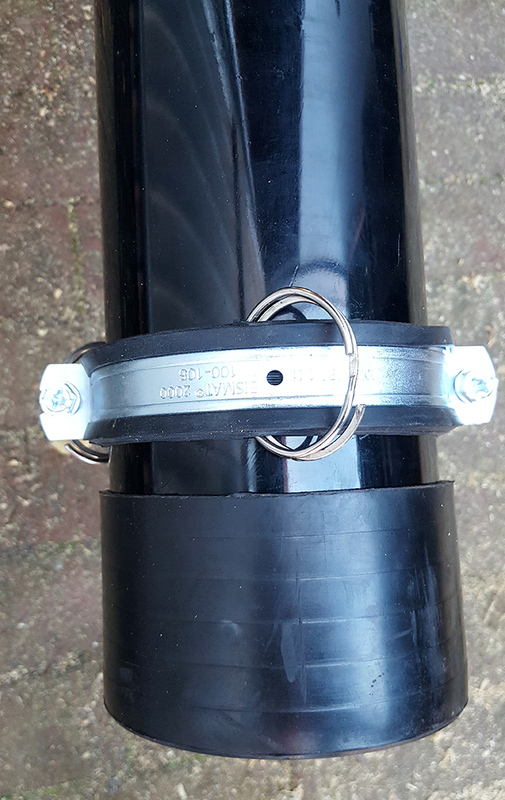 If you have a good support - like the one I build that I attach to my car, or some strong fixed pole you can tie the mast to - it is possible to set this up on your own. Otherwise you need more people. When we used it in the open field during the PACC, we need 3 people. A few months ago I build a simple support system for my 18m pole that allowed me to set this mast up in the open field without any hassle. I have been using this more often and started to think if I could make something for the 26m mast as well. I wanted to use a bigger surface this time, but use a different structure because it would become too bulky if I just enlarged the 18m version. Walking around in a DIY store I stumbled upon a flat roof vent. The inner diameter is just over 110mm allowing the 26m pole to slip through with the end cap on. 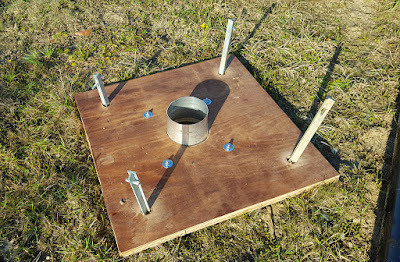 Now picture this thing pressed between 2 layers of wood with holes on each corner for stakes / pegs. I could just see this working. So I took this home and started working on the two layers of wood. 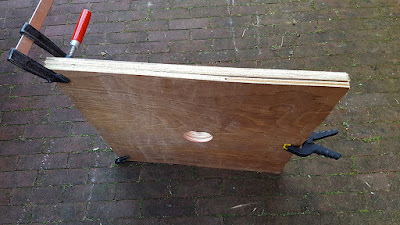 I chose plywood and cut two pieces approx 60 x 60 cm. 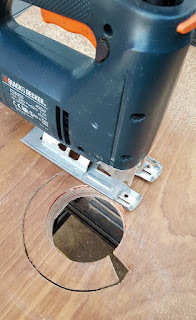 I chose the bottom layer a bit thicker so I could sink the bolts I was going to use into the wood (and that way keep an even surface). In the picture you can see that I already cut a hole in the middle with the largest hole saw I have. 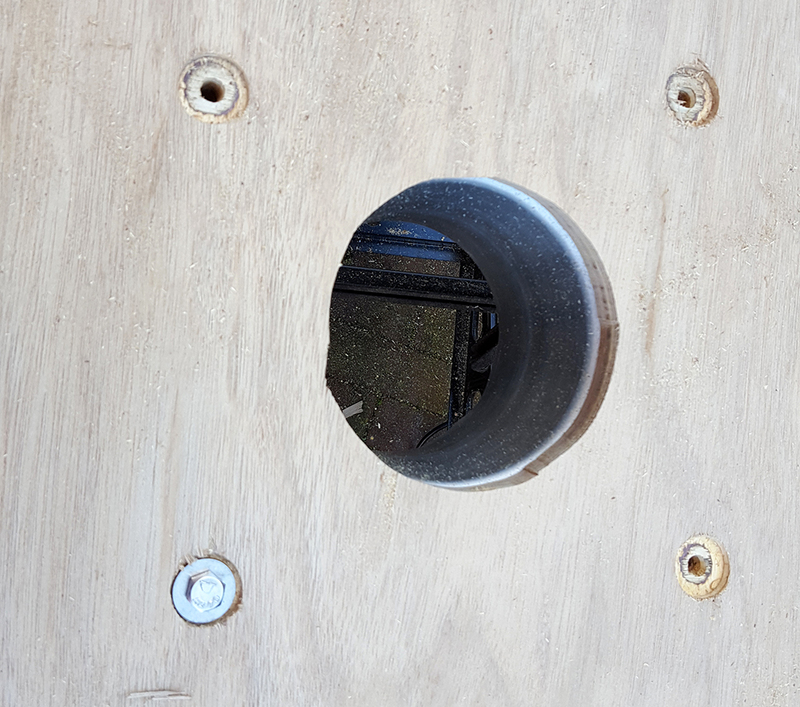 That saw is only 83mm so I next I enlarged the hole. 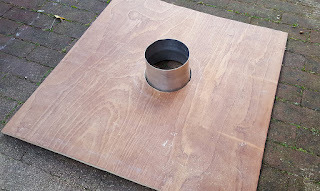 I added 4 bolts though both plywood layers and the metal, made 4 large holes (25mm diameter) near the corners and glued the two layers of wood together. 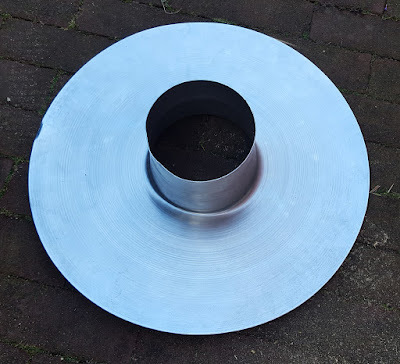 Another thing I did (like with the 18m pole) is to add a fixed ring on the top of the lower segment of the 26m pole and add three guy rings to it. I finished the work yesterday, so today I could make good use of the brilliant weather we have at the moment to go out and see if my construction works. Just for a comparison of size I put the 26m and 18m poles side by side with the two mast supports. 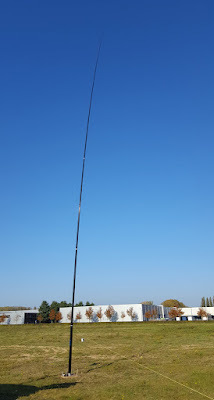 I then started setting up the 26m pole. I used four stakes in the corners of the plate I constructed. They were of different size and mostly too long as you can see. However, they still do the job. As I hoped, the collapsed pole slipped in nicely and stayed upright - even before I guyed it. That is very convenient as it allows you to add the guy lines one by one and adjust the tension of each one until the pole is fixated and completely vertical. I then pushed the segments out with my 20m long end fed wire attached to the upper segment (while I was there I might as well make some contacts). I was lazy and only wanted to assess if my idea worked so I did not guy the pole on any other level. As you can see the pole was not completely vertical. This was due to a lack of tension in the guy lines (will put on more tension next time) and of course due to the lack of guy lines higher up. It stayed up though and I was able to make a couple of WWFF contacts in the half hour I was there. It is easy to set up and break down the way it works now, so I am pleased. The one thing I do need to add is a small step or something else that allows me to stand a bit taller. I am 2m tall but still the pushing out of the last segments is heavy work.